Searching for fonts that look like Myriad® Bengali? Look no further! 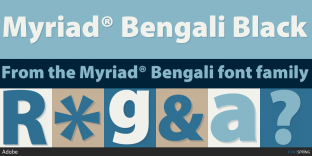 Here you will find fonts that look like Myriad® Bengali. Use the selector above to match other fonts in the family. Worry-Free! Graphein Pro FontSite Inc.
Worry-Free! DDT Typodermic Fonts Inc.
80% off until Apr 29th! ©2019 Fontspring. All rights reserved.